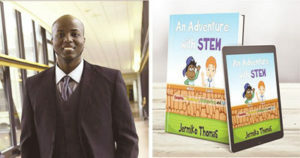 UTICA, NY (BlackNews.com) — A new children’s book will be launching this month titled, An Adventure With STEM, and will be available for purchase through Amazon and Kindle. The book is focused on showing children how much fun they can have learning about science, technology, engineering and math. It is the second children’s book to be released by award-winning author, Jermiko Thomas. An Adventure With Stem is about a boy named Lucas who doesn’t have a desire to learn and would rather spend his time playing. Moe the toad wants to help his friend Lucas to find enjoyment from learning. Once Moe goes missing, Lucas and his friend Walter set out on a mission to find the lost toad. Along the way, the boys must use the four pillars of STEM – science, technology, engineering and math on their mission to find Moe. The boys meet many characters along the way that help them to learn and find their missing friend Moe. As a child, Thomas struggled with talking for the first six years of his life. He visited many different doctors and was mis-diagnosed many times in his young life. Although he struggled, Thomas had a great support system at home. His parents which pushed him to work hard, and ultimately, he persevered and ended up testing out of the resource program he was put into in his junior year of high school. Thomas then transformed his life, harnessing the power and knowledge he found in books. He would read any book he could get his hands on and the books helped to change his life completely. Through his own transformation, Thomas decided to make it his mission and purpose to help other people dismantle the “no outlet signs” once and for all. From his past, he knows that people can overcome any obstacle put in front of them and he wants to share that positive message to the world through his children’s books, helping the youngest generation of readers discover their true potential and the power they must be whatever they desire.